The Tax Invoice is an Official accounting document which represents a real deal and describes the goods / services that were provided by the seller in Exchange for money. This document is used by the Taxes Authorities for the collection of VAT and Income Tax, and therefore it should be produced only for real deals. Hyper offers its users a simple and easy invoice production process. The Tax Invoice is created based on a real and exist order and can contain (or combine) items and services from the orders system, manually created deals and Committed / Prepaid Products. Hyper offers its users to produce Tax Invoices and Tax Invoices Receipts. It allows to import items from several orders or Delivery notes, into a single Tax Invoice. Hyper does not have a designated DB for Tax Invoice Receipts (there is a separate DB for Tax Invoices and for Receipts), and therefore the system creates a linkage between these documents and produce both of them as one printed document. According to the local rules of the organizations country, the system summarizes the VAT from all of the Tax Invoices and updates the Vat Report. The Vat percentage is automatically updated by the system, by synchronizing with the local country authorities. Manual Billing - For items with no exist order. Ordered Items Billing - The system will import the ordered items and will present the list of items that have not been paid yet. Prepay for a product - according to the organization policy or for customers that are interested in prepaying for goods or services. When choosing the Tax Invoice tab, this area background will be differently colored and will contain fields and action buttons according to the users activity. In the center of the screen, the invoice items table presents the items, services and notes related to this invoice. The table also presents additional information about the items and services, descriptions, quantities and prices. The fields at the top of this screen are used to define the addressee of the invoice as will be explained below. Please Note- additional information fields can be added by the user. Load Document - Load a produced tax invoice. Please see the next section. Create a new Tax Invoice. For further information, please click here. Produce a Tax Invoice Receipt - For customer that is paying when producing the Tax Invoice. For further information, please click here. Produce Origin Document. For further information, please click here. Cancel / Retrieve Document . For further information, please click here. By using this option, the user can produce a certified copy of produced Tax Invoice. The system will add the title "Certified Copy" at the top of the document. Also, according to the definitions in the client card ("Send Official Documents to Primary Email" field), a digital copy can be sent to the client. Previous / Next Record buttons, allow the user to browse through the records of the produced Tax Invoices. The system allows to cancel a Tax Invoice document, as discussed in the section of Cancel / Retrieve Document. Retrieve a canceled document and any inventory transactions associated with it, as discussed in the section of Cancel / Retrieve Document. In order to create a new tax invoice, press the Create New button. This will clear the Invoice Items table. The system will automatically offer the user to choose items from a list of ordered items that have not been paid yet, presented in the "Import Open Items from Orders / Delivery Notes" window. The fields at the top of the table are used to define the addressee of the invoice. The "contact Person" field is used to choose a person that will be mentioned in the "Intended for" title of the Invoice document, while the "Apply To" title will be referred to the company. If the Tax Invoice should be referred to the contact person, choose "Contact Person" in "Directed to" field. Adding products manually is done by adding a new row to the Invoice Items table (press Ctrl+Enter or use the right mouse button and choose "Add New Row") and filling in the relevant fields. Also, the user can press the Add Product button and select a product from the list or use the Search Wizard. When adding a product manually (not from the products list), there is an additional option in the "Taxable Selling Price", of deducting the TAX from the selling price, by pressing the icon. This option is available only when defining the "Point of Sale Extra Feature" field of the product card as "The Product is Priced Manually". The user can add additional remark to each of the products lines in the Tax Invoice. In order to do so, create a new line above the required product and write the remark in the "Description" field. You can move the lines in this table, by pressing Ctrl + Up/Down arrow of the keyboard. Alternatively, right click on the mouse and choose "move row up / Down". Use the Import Open Items from Orders / Delivery Notes button to import unpaid items from the orders system that are also presented at the "Carry Out" label. by using the check-boxes the user can choose the required items for the Tax Invoice. The Import Open Items from Orders / Delivery Notes window presents all of the unpaid orders and delivery notes. Each line shows its order details and includes the order number, quantity, unit of measure, Quantity ready for supply, Quantity on Delivery Note and Quantity on Tax Invoice. In order to add the items to the Tax Invoice, use the check-boxes to mark the required items. At the bottom of the window there are two action buttons to Check-All or Un-check All. Press the OK (F6) button to confirm and continue. Sales Agent The name of the sales agent, to choose from the "Select Users Dialog" window. Tax Rate Percent This field is used to choose the Tax Rate Percent. Users can choose the previous Tax Rate Percent. Purchaser Currency Choose the currency for this document. After choosing the required items, the user can add some notes to be printed on the Tax Invoice. In this area, the user can add any relevant information. Also, the user can edit the client personal details (for this document only). In the "Internal Notes" field, the user can write any note for internal use only. The internal notes will not be printed on the document. The Prepay for a Product button is used for payments on future delivery items or services. This option is available according to the organization policy is defined in the System Fundamentals, in the Bookkeeping label. in order to make it available, choose "YES" in "Enable Prepaid Products" field. This action will add the prepaid products to the list of "Committed / Prepaid Products" in the "Rules" label of the client card sales area. The system allows the user to receive an immediate payment from the client and produce a Tax Invoice Receipt. By using the "Paying Now" label, the user can choose the payment method (choosing a multiple payment methods is also available). Since Hyper does not have any dedicated DB for Tax Invoice Receipts, the system creates a linkage between the Receipt and the Tax Invoice and produce both of them as one printed document. Please note - a receipt can be produced only when the total payment amount equals or higher than the total charge. Cash In the Payment Details window, the user can fill in the total received amount. Alternatively ,the user can also choose the received bills / coins and fill in the amount of each. At the bottom of the window, the user can find the updated Account Balance. Credit Card Using a Credit Card payment device. The credit Card details will be automatically filled in the relevant information fields. Total Amount - the user can fill in any amount (in case of partial credit card payment). Currency - choose the required currency from the list. Credit Card details - Card number, Valid Month & Year, CVV. Monthly Payment - According to the organization policy. The first payment can be changed by the user. The rest of the payments will be automatically and equally calculated. Credit Card Owner Details - When entering a C.C Details Manually, fill in all of the Owner details. Enter C.C. Clearing Confirmation (by 3rd Party) Fill in the Credit Card Owner details as well as the Monthly payments. The system will ask for the Cheque / CC number and the CC Brand Name. cheque In this window, the user should fill in the bank details as well as the Account owner or contact person. The user can use the Banks Index button to find the required branch and the system will automatically fill in its details. At the table, the user should write the cheque details. Using the Add Sequential Cheque button, will add a new line with the following cheque and the same amount for thew following Payment Date. These fields are editable. In the "Bank Transfer" window fill in the account and the bank details as well as the amount and payment date. Produce a receipt after receiving a bank transfer. The receipt will create a new Bookkeeping entry from the client card to the "Bank transfer Default Account". In this account, the bookkeeping entries will be bundled with the imported bank statements. If the receipt does not create any bookkeeping entry, when there is no defined "Bank Transfer Default Account", the account manager should import the bank entry statement and bundle it with the clients account. Remove Item Remove the selected payment record. After updating the Invoice Items table, it can be produced. The user can use the Preview button to verify the relevant details. To produce the Tax Invoice document, press the Produce Origin Document button. The tax invoice includes the personal details of the client and the user as well as the orders and the items details, Selling Price and Currency and Total Charge. 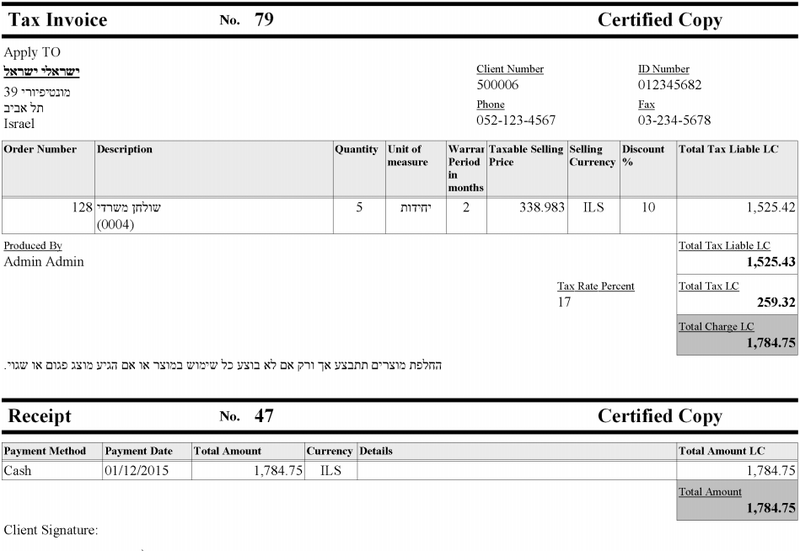 At the top of the document there is the Tax Invoice number. When the user creates a Tax Invoice Receipt, the receipt document will be added to the same page. No - The original official document will be printed from the users computer. Digital Signed PDF - the original document will be sent to the Customer/Supplier Email address. Get copy after printing the Original - the Original document will be printed, while a certified copy will be sent to the clients / suppliers Email address. In the Tax Invoice notes label, you can find the Cancellation time, Cancellation Reason and the name of the user that made the cancellation. The canceled Tax Invoice can be retrieved by loading it and pressing the Retrieve Document button. Please note - Canceling a Tax Invoice document is not a Credit Tax Invoice! Only tax invoices that were not delivered to the client can be canceled. The original document should be kept by the accounting manager and it should be marked as canceled. Canceling a Tax invoice that was delivered to the client can be canceled only by producing a Credit Tax Invoice. Please Note - According to the local law and regulations, Tax Invoice and its bookkeeping entry can not be deleted. In the Agencies Label of the System Fundamentals, the user can define "Default Notes for Local Tax Invoice", that will be printed on the Tax Invoice document. As default, the tax invoice document includes the order name, description, unit of measure, prices, tax rates and Total Charge. The organization can choose the required fields for its invoices in the "Built-in Docs Printing Customization" label of the System Fundamentals. The VAT rate is defined from the "Sales" label of the System Fundamentals, by pressing the Update VAT/GST rates from SYE server button. This action will synchronize the local VAT/GST rates table with the local Tax Authority, according to the organizations country, as was defined in the Global & Basic Settings. Otherwise, the rates should be updated manually. In order to use the Add Product button, the products should be created at the "Product Design Module". The Prepay for a product button is available due to the organization policy and the definition of the field "Enable Prepaid Products" in the Bookkeeping label of the System Fundamentals. 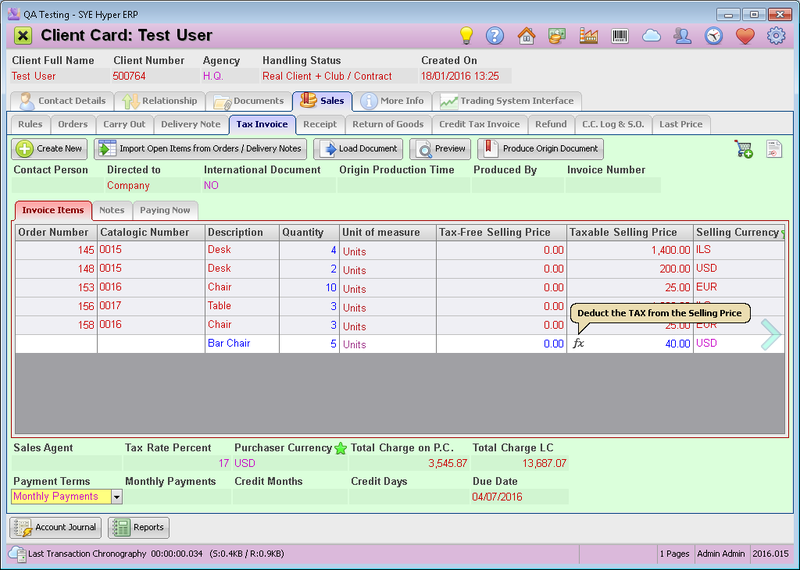 The user has three options for the user interface of receiving Cash: Bills table / Bills table and Free Field / Bills Skin. The user can choose his favorite UI in the Bookkeeping Label of the of the System Fundamentals, using the "Receipt / Refund Cash UI" field options. Using the "Duty Fields for Original Sales Document" field, in the Bookkeeping label, the user can define mandatory information fields required to produce Tax Invoice. Using the "Print # Copies for every Original Tax Invoice" field, in the Bookkeeping label, the user can define how many copies will be automatically printed for every original Tax Invoice. Using the "Number Tax Invoice From" field, in the Bookkeeping label, the user can define the first Tax invoice Number. The Tax Invoices numbering will start from this number. When having foreign clients, the organization can convert the rates to the clients currencies. This can be defined in the "On International Doc Convert to Purchaser Currency" field, in the Bookkeeping label. According to the local law and the organization policy, the system admin can define the Total Amount LC of a deal, to require a Client ID. This should be define in the "Require Client ID beyond Total Amount LC" field, in the "Sales" label of the of the System Fundamentals.